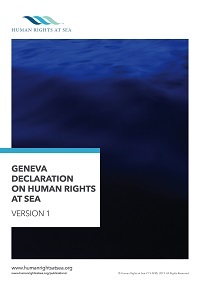 The first version of the inaugural Geneva Declaration on Human Rights at Sea has been published by Human Rights at Sea after the initial drafting session was held in Switzerland in March 2019 at the Graduate Institute of International and Development Studies, Geneva. The principal aim of the Declaration is to raise global awareness of the abuse of human rights at sea and to mobilize a concerted international effort to put an end to it. 1. Human rights apply at sea to exactly the same degree and extent that they do on land. 2. All persons at sea, without any distinction, enjoy human rights at sea. 3. 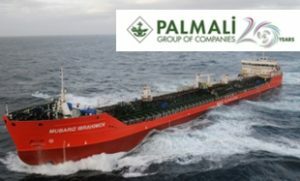 There are no maritime specific rules allowing derogation from human rights standards. 4. All human rights established under treaty and customary international law must be respected at sea. The Declaration recognizes established International Human Rights Law and International Maritime Law, highlights the applicable legal assumptions and reflects the emerging development and customary use of the increased cross-over of the two bodies of law. The Declaration was first announced to students in Malta on April 4 at the IMO International Maritime Law Institute (IMLI) during the second Human Rights and the Law of the Sea workshop held in co-ordination with the Stockton Centre for International Law; and has now been briefed at the World Maritime University, Malmo, Sweden, during the Empowering Women in the Maritime Community conference by the charity’s Iranian researcher, Sayedeh Hajar Hejazi. The first drafting round was supported with input and observers from multiple U.N. agencies, leading human rights lawyers, international and civil society organizations. The Declaration is available here.